BN has closed one eye on Namewee’s insult against national flag for political consideration. Therefore, many youth thought playing with the national flag is a fun and cool stuff. China communist regime is slowly decoupling communist government is the nation by removing loyalty to communist party slogan in the police and military. 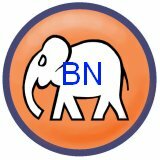 BN has inculcated a wrong concept to new generation that BN government is the nation. 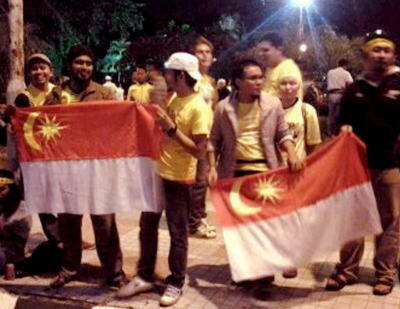 A tiny Bersih protesters fall into the trap by suggesting alternative flag for their hate against BN government. You dislike Najib is perfectly ok, but insulting his and his wife by stamping on their poster is a wrong act because Najib is Prime Minister appointed by the King, the only legal representative for the nation. Police and BN government allow Perkasa idiots stamping and burning Lim Guan Eng’s poster is not the license for you to follow Perkasa. That is why I alway delete any comment poking fun on Najib and his wife. If these people think by modifying Indon flag as alternative flag for Malaysia is a right thing to do, they should be charged for treason against the nation and the king.